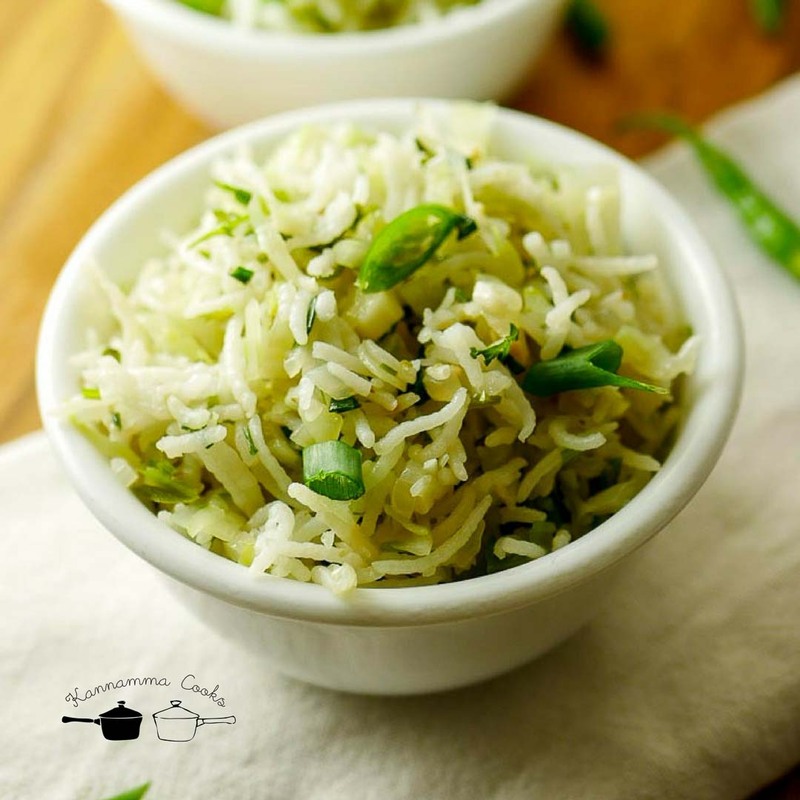 Recipe for easy vegetable rice made with cabbage and herbs. Very easy lunch box recipe that can be put together in under 30 minutes. Recipe with step by step pictures and video. Cabbage rice recipe is something I whipped up one day when I did not have any other veggie in the fridge and it turned out to be so good. I never knew until then that it was a thing. Looks like the whole world knew about Cabbage rice and I did not. This is currently my son’s favorite. The “favorite” thing keeps changing like seasons but currently I am happy and he is happy and Cabbage rice is something that we are doing almost every week. I sometimes add green chillies for the spice and sometimes just black pepper. I prefer the black pepper version as its very earthy. This is also perfect for the busy mornings for packing lunch box. This recipe can be made in under 30 minutes. If you are in a rush, making the rice the previous day and keeping it in the refrigerator comes very handy too! First, lets talk about the rice. We will be using basmati rice for making fried rice. The whole idea is to get the texture right. Its very important that the grains of rice do not turn mushy. Here is how I do it. 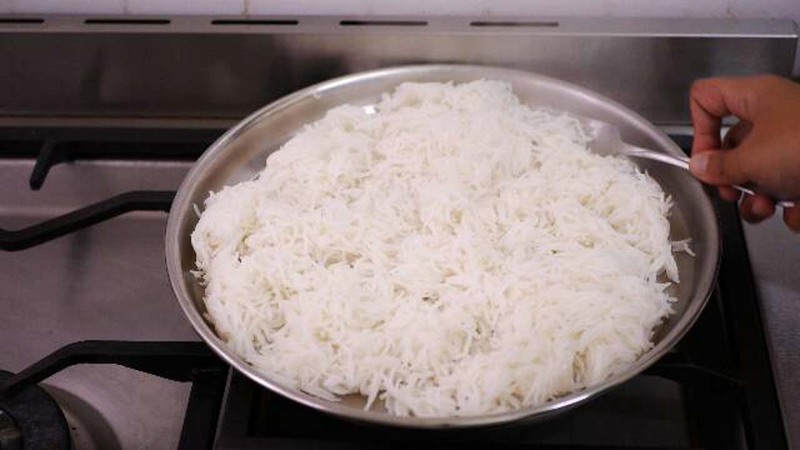 Wash and soak the basmati rice in water for 20-30 minutes. Drain the water. Add 1.5 cups of water to every cup of rice used. Cook in a pressure cooker, medium flame – for exactly 2 whistles. Switch off the flame and allow it to rest for 5 minutes. After 5 minutes release the pressure from the cooker using a fork or a spoon. Open the cooker and fluff up the rice. Immediately, transfer the rice to a plate to cool it down completely. The rice needs to be completely cool before you start cooking the fried rice. Heat oil in a pan and add in the finely minced garlic and finely minced ginger. Fry for a couple of minutes. I have used peanut oil today for making this cabbage fried rice. Add in the green chillies and Italian seasoning. For a variation, instead of green chillies you can add black pepper and that will have a different flavour. If you do not have Italian seasoning, you may even skip adding it. But it gives a nice aroma to the rice. Here is where you can buy Italian seasoning. Add in the onions and saute for two minutes. We don’t need the onions to become brown. Sauteing for a couple of minutes will do. Add in the capsicum. Add in the chopped cabbage. Saute for 5-7 minutes until the cabbage is 3/4th done. Add in the chopped spring onion and coriander leaves. Add in the salt and the sugar. The little sugar will balance the taste. Fry briefly for 2 minutes. We are adding the salt at the end as we do not want the veggies to become mushy. Adding salt in the beginning will make the veggies give out the moisture and will lose its crunch. So add the salt after the veggies are cooked. Add in the cooled rice and mix well to combine. Cabbage fried rice is ready. Serve with gobi manchurian or orange chicken. 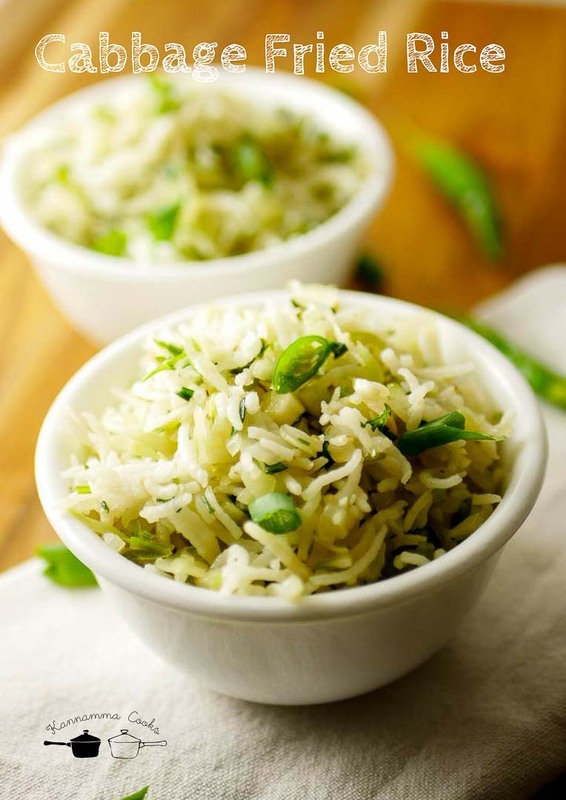 Wash and soak the basmati rice in water for 20-30 minutes. Drain the water. Add 1.5 cups of water to every cup of rice used. Cook in a pressure cooker, medium flame – for exactly 2 whistles. Switch off the flame and allow it to rest for 5 minutes.After 5 minutes release the pressure from the cooker using a fork or a spoon. Open the cooker and fluff up the rice. Set aside on a plate to cool. Heat oil in a pan and add in the finely minced garlic and finely minced ginger. Fry for a couple of minutes. Add in the green chillies and Italian seasoning. Add in the onions and saute for two minutes. Add in the capsicum. Add in the cabbage. Saute for 5-7 minutes until the cabbage is ¾th done. Add in the chopped spring onion and coriander leaves. Add in the salt and the sugar. The little sugar will balance the taste. Fry briefly for 2 minutes. More exciting to listen the video than the recipe. 😁 indeed waited for your audio. Will try soon and let you know. 🙂 Mam one request.. could you please share your cook Ware essentials, some basic and also must have essentials along with the brand. Being a beginner I have wasted enough money on certain products. Pls help. Hi Pradeepa, Thank you. I will do one soon.